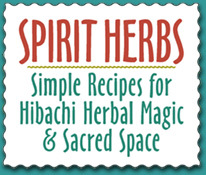 In Spirit Herbs, Martin provides a short easy-to-read reference for using herbs. Her recipes are easy to follow with clear directions for combining all the different herbs and she gives the reader a larger quantity to follow based on cups as well as a simple way to adjust the batches for smaller or larger batches. Martin is straightforward about her technique, for her commonsense is the rule to follow. And with her slightly tongue in cheek tone she reminds the reader to be responsible and not burn themselves up. Another example of her down to earth approach comes early in the book when she discusses how herbs are sold by the ounce but she realizes most people don’t own a scale so she provides a very useful conversion charter from ounces to cups. Here is where she practices the common sense she preaches. Right off the bat Martin outlines her two techniques for working with herbs in rituals. Her writing style is clear and straight forward. The reader feels like he or she is having a friendly chat about herbs. Martin’s slight sardonic sense of humor entertains the reader on a topic which could be a bit dry. Her directions are easy to follow. Martin breaks a few barriers by talking about strewing herbs by asserting it is more than okay to walk on the herbs. Rather than treat these tools like sacred untouchable artifacts, she asserts that walking on the herbs helps to activate their energy. Martin’s book is small so she doesn’t include a complete list of herbs. She tells the reader outright this is the case. Rather than leave the reader hanging though she provides other sources. She lists both books and websites so the reader can choose the level of technology to use in researching a particular herb. Martin has provided a strong resource for using herbs. Her tone and style are comfortable and easy to read. Her techniques are unique and convenient for use by nearly anyone. It is obvious she has used the techniques extensively and has put a lot of research and time into this book. Quality shows. Martin has created a quality book of herbs.